Fitment:1978-'91 HD® big twin Custom engines using S&S® crankcases. Features and benefits: Same width oil supply and return gears as the stock HD® aluminum pump. S&S® pinion and oil pump drive shaft drive gears increase potential oil volume delivery by 25% over stock on 1972 and earlier engines. Machined with an oil pressure relief bleed off passageway & relieves pressure build up on top of the valve to maintain consistent oil pressure. Oil pressure regulation bypass routes excess oil directly to the supply side of the pump & reduces the amount of oil returned to the tank, less foaming and cavitation. The standard pump cover allows total flexibility for oil system configuration with a number of oil feed and return options.Offered primarily for scratch built applications where the builder is usually starting out with aftermarket crankcases and needs all of these parts. Also be applied to older engines where a complete overhaul requiring all new parts is to be performed. 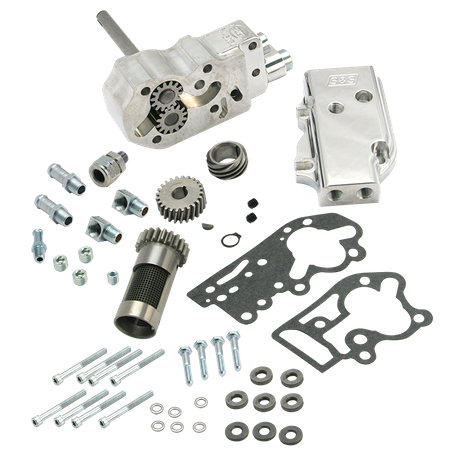 Kit Contains:Complete oil pump assembly, Mounting hardware, fittings and gaskets, Instructions, Pinion shaft pump drive gear, Oil pump drive shaft gear, and Breather gear.